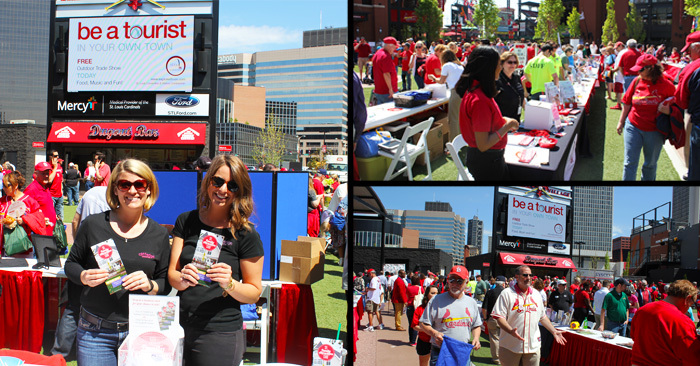 The Family Attractions Card recently participated in Explore St. Louis‘ ‘Be a Tourist in Your Own Town’ event at Ballpark Village. 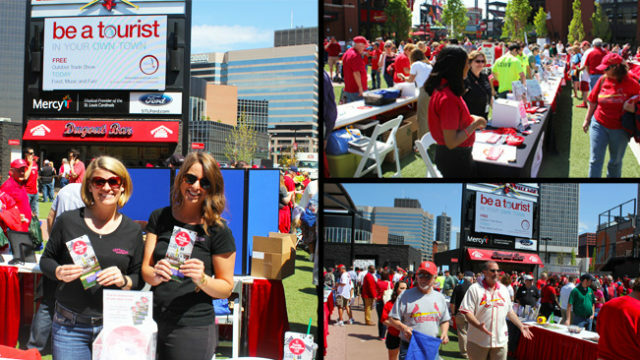 The ‘Be a Tourist in Your Own Town’ event gives area attractions the opportunity to visit with St. Louis locals before a St. Louis Cardinals day game and show off what’s new. This got us thinking about what it means to be a good ambassador for the city of St. Louis. When out-of-towners ask ‘What’s there to do in St. Louis?’, we can recite all the best parts of our city like the Saint Louis Zoo, Grant’s Farm, or The Magic House, but are we spending enough time experiencing them for ourselves? Sure, you probably support the Cardinals and Blues by going to a game or two over the season. But have you ever been to an Opening Day Rally in Kiener Plaza? And maybe you’ve been to the Arch grounds for a picnic, but have you ridden the tram up to the top? What self-respecting St. Louisan hasn’t had a Fitz’s Root Beer? But have you actually watched them bottle it at their restaurant in the Delmar Loop? Maybe it’s time for us revisit our iconic destinations and experience them again for the first time! There are a few no brainers in St. Louis when it comes to food. If you’re salivating for salami or a proper Italian meal, head to the Hill and choose from countless dining experiences that feel as much like a traditional experience as they do a great meal out. From elegant dining to just grabbing a ‘sammich’, dinner is waiting at The Hill. If your sweet tooth is acting up and you can’t justify yet another trip to Ted Drewes this month, change it up and try a root beer float at Fitz’s Root Beer in the Delmar Loop! These things are ginormous and just as yummy as you remember. You can also become a kid again by grabbing a caramel apple at Merbs Candy Shop, eating a whole bag of Dad’s Original Scotch Oatmeal Cookies (we’re not proud, but yes, we’ve done this), or get a freshly made Gooey butter cake from Gooey Louie. Running low on fruits and veggies? Forget about the grocery store and start your shopping experience at Soulard Farmers Market. Set in the historic Soulard district, this outdoor market lets you fill up on farm fresh produce and meats while you treat yourself to a few fresh fried mini-donuts and sip on a cold frosty one or even a Bloody Mary. It’s a unique place to shop if you enjoy amazing deals on produce and even more amazing people watching. And let’s not forget about tasting some of the foods that have made St. Louis famous! Grab some toasted ravioli at one of the many restaurants on the Hill that claim to have invented it, a St. Paul Sandwich at any local Chinese restaurant, and once you’ve eaten all of that, grab some TUMS antacid, proudly made in St. Louis since 1928 (OK…not technically a food, but you’ll be eating a lot of them if you try to tackle this list). We all like butterflies, but when’s the last time you were covered in them? Become a kid again and make a trip to the Sophia M. Sachs Butterfly House in Chesterfield. This 8,000 square foot butterfly conservatory offers educational programs, special events, lectures and of course, the chance to witness those beautiful butterflies. It’s a great way to meet nature face-to-face and help kids see these gorgeous flying works of art in an amazing habitat. Speaking of art…a casual walk through Laumeier Sculpture Park in Sunset Hills puts you directly on the pathway of the magnificent sculptures and exhibitions that make up one of the biggest open-air museums around the world. It’s an amazing (and free) summer picnic spot where the kids can run free and gain a little culture as well. 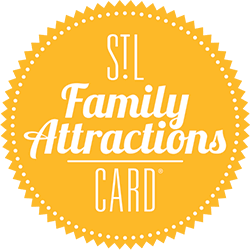 And if you need more great local attractions to keep the kids busy, check out downtown St. Louis’ Citygarden, just off of Market Street or head to Purina Farms in Gray Summit, MO and bring the family pet with as well. Both offer special opportunities to entertain the whole family for the low, low price of free! You know that we have a wealth of museums in St. Louis, but if you haven’t visited them since your last grade school field trip, you’re really missing out. Some of the city’s best museums are located in one spot–Forest Park. Balance exploration, excitement, and education at the Saint Louis Science Center, see what real beauty is at the Saint Louis Art Museum, and revisit some of the most important events that have shaped Missouri into the state it is at the Missouri History Museum. You’ve probably driven by places like the Old Courthouse, Cathedral Basilica and Meramec Caverns but have you ever stopped to go inside? Spend the day reliving history by seeing where the famous Dredd Scott trials took place, viewing over 41 million glass pieces in the largest mosaic collection in the world, or visiting the alleged secret hangout of the infamous outlaw Jesse James. You don’t even need a ticket at some of the best places to see live, free music. Just throw down a blanket onto the grass and lay back at the Missouri History Museum’s Twilight Tuesday Concert Series, hosted on the museum grounds. Dance barefoot in the grass all night long at the free Whitaker Concert Series at the Missouri Botanical Gardens on Wednesday nights during the summer. And for those further West, Faust Park puts on some amazing shows during their Summer Concert Series. Looking for more shows? Check out this super cool website that lists every upcoming free musical performance: www.freeconcertsstl.com. Start being a tourist in your own town! We really do have a great city with an amazing array of unique experiences that should be experienced by everyone, not just out-of-towners. So the next time you have family come in to town and they ask where they should go to ‘see the city’, tell them you know the perfect spot…then put on your jacket, grab your keys, and tell them that you’re driving! Guest Blogger Peter Cartier, a freelance writer, contributed to this blog.